The Australian Merino is not a single homogenous breed but a number of ‘strains’ of sheep all of which, regardless of their origins, are uniquely Australian. The major factor determining the Merino’s development has been the requirement for environmental suitability. Few, if any, domestic animals in Australia or any other country have shown such resilience or responded with such versatility and success to this country’s enormous variations in climatic conditions, management and husbandry techniques. By skilful breeding and selection, the pioneer breeders set down the foundation of the Australian Merino. The clip profile of wool has shifted in recent years. 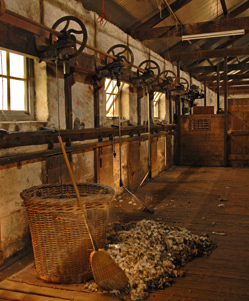 During the 1990s, an increasing number of woolgrowers focused on fining their wool in an attempt to capture the apparent premiums in the market. The rise in the proportion of fine wool, particularly superfine wool, estimated to be around 24% of the market, has seen the gap between fine and mid-micron prices narrow. The large dual purpose strain of SA Merinos and Poll Merinos was initially developed from strains introduced into the Eastern States. Many Australian flocks are based on bloodlines developed in the 1800s by South Australian parent studs such as Bungaree, Capeedee, Anlaby and Collinsville.